"Cash has come down in the economy..there has been a 20 per cent reduction in cash relative to what might have been without demonetisation," Arvind Subramanian said. 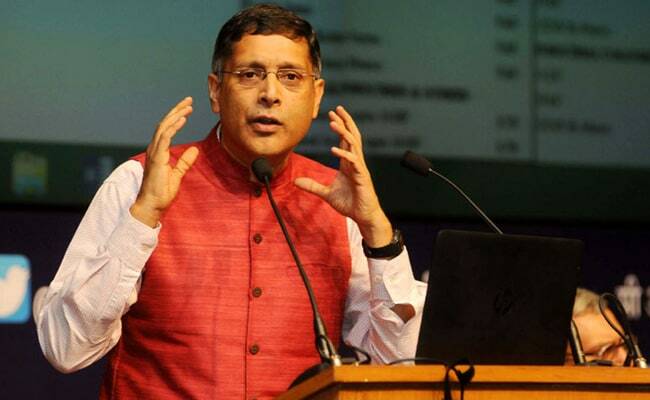 New Delhi: Describing the impact of demonetisation on the Indian economy, Chief Economic Adviser (CEA) Arvind Subramanian said on Friday that there has been a 20 per cent reduction in cash in the economy. "Cash has come down in the economy..there has been a 20 per cent reduction in cash relative to what might have been without demonetisation," Subramanian said in a briefing following the release of Economic Survey 2016-17 - II, authored by him, which was tabled in Parliament earlier in the day. "The cash-to-GDP (gross domestic product) ratio has come down to 1.6 percentage points," he added. Curency in circulation declined significantly following the demonetisation of high-value notes. The Survey said that, as on the end of the last fiscal on March 31, currency in circulation contracted by 19.7 per cent whereas reserve money contracted by 12.9 per cent. The CEA said there had been a "regime shift in terms of macroeconomic stability since demonetisation", pointing to the addition of new taxpayers in the system. "5.4 lakh new tax payers have been added in the post-demonetisation period (November 9, 2016) up to March 31, 2017... a big number," he said. The Economic Survey said "a series of deflationary impulses are weighing on an economy yet to gather its full momentum"
It highlighted decline in farm revenues and non-cereal food prices, farm loan waivers, fiscal consolidation and declining profitability in the power and telecommunication sectors as the factors generating deflationary tendencies. The November demonetisation took a toll on the Indian economy with the Gross Domestic Product (GDP) during the fourth quarter, ending March this year, falling sharply to 6.1 per cent from seven per cent in the previous quarter while growth for entire 2016-17 also declined correspondingly. Subramanian said farm loan waiver by states would have a deflationary effect by cutting demand in the economy by between 0.4 to 0.7 per cent of GDP. "Farm loan waivers by states could amount to anything between Rs 1.25 lakh crore to Rs 2.75 lakh crore," he said. He explained that while the Centre would not relax on the fiscal borrowing limit of the states, which, in order to make the farm loan waivers, would then be forced to either make cuts to expenditure or raise taxes, both of which would have a deflationary impact.